Heifer International South Africa (Heifer) has developed a five year project called the KZN Goat Agribusiness project with the Department of Rural Development and Land Reform, KZN Department of Agriculture and Land Reform and Mdukatshani Rural Development Programme. The total five year budget is over R70 million rand. The areas of focus are in five local municipalities of Mzinyathi, Thukela, Uthungulu, Zululand and uMkhanyakude (Msinga, Nkandla and Jozini). Heifer will be working with 140 livestock dip tanks over the five years and supporting approximately 28,000 farmers to increase their herd productivity with the goat commercialisation. 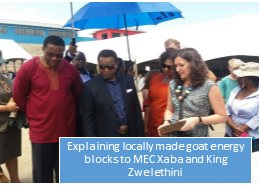 As part of launching this project MEC of KZN Agriculture Mr Cyril Xaba made the decision to host a Goat Expo in Msinga on 30 January 2016. The purpose was to show a variety of possible goat breeds, showcase work that Heifer and Mdukatshani has been doing in creating training materials, youth job creation, value addition products such as goat skins and supplementary feeds and finally a goat meat cook off. Goat meat in South Africa is seen as just a byproduct of slaughtering goats for ceremonial purposes and not as a tool to help end food security in the country. This partnership between Government and NGO’s hopes to change that perception and to get more communities eating goat meat. The target audience for the Expo were goat farmers with the purpose of helping them with their drought stricken livestock and key leaders in the KwaZulu Natal Province. There were over 500 people in attendance (farmers, government, traditional leaders, community leaders from Msinga, Jozini and Nkandla and dignitaries). The keynote speaker and dignitary was King Zwelethini, the reigning king of the Zulu Nation since 1968. As part of the day’s proceedings, Heifer’s CEO, Marisia Geraci, had both the MEC’s audience and later the King’s audience. With the assistance of Gugu Mbatha from MRDP, Heifer’s CEO went through Heifer’s work and how we are supporting goat farmers and youth job creation. It was only the second time that the King had visited Msinga. He comes from the area of Nongoma (which is part of Heifer’s new Jozini Agricultural Development project, supported by the European Union).